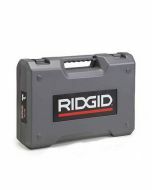 The RP241 is the latest tool in the Ridgid Compact Press Tool family. 25% smaller and 10% lighter than its predecessor (RP200), this lightweight, low profile design, is ergonomically designed to help you easily work overhead and in tight spaces. Multiple Size & System - tool can go up to 1-1/4" on Copper & Stainless Steel, up to 1-1/2" on PEX tubing, and up to 3/4" Iron Pipe. New 12V Lithium-Ion Battery - Over 140 crimps per charge.